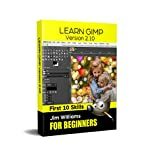 Now, there's a 1-2-3 Fast & Easy Way For You To Master GIMP And Start Designing Amazing Graphics in 180 Minutes Or Less... And It doesn't matter if you're a complete graphics newbie or a seasoned design pro, you can discover the secrets of GIMP and create graphics that practically JUMP off your screen! Have you always wanted to do the things the pro's are doing? Now you can! In ’The Ultimate GIMP 2.10 Guide’ you will learn professional photo editing, retouching, and e-book cover design in GIMP 2.10 in easy steps. The book starts from the very beginning, so when you are new to photo editing, that's no problem! The book starts with installing and configuring GIMP 2.10 to make it look and act as Photoshop. Then all aspects of photo editing are covered, and no stone will be left unturned! Everything will be shown in easy to follow steps. You will learn how to improve and correct photographs professionally, and how to work with layers. You’ll learn how to crop images, how to resize images, how to save images for web, how to save images for print, and how to make PDF's. You will learn professional retouching, like skin retouching with frequency separation, Liquify (for example to make someone thinner), how to let the program remove objects, and how to remove objects with the clone and heal tool. You will learn how to use masks, and how to make selections. In Chapter 5 we will go in to making professional selections with just a single click (this is not possible in Photoshop!) using the patented 'U-point technology'. The U-point technology is delivered by the Google Nik Collection, a professional high-end photo editing ‘’plug-in’’ suite, used by professional photographers. The Google Nik Collection and its integration into GIMP will be discussed in its whole. So in addition to gaining great expertise in GIMP, this book will also cover the complete Google Nik Collection. We’ll download and install the software, together with a special plugin that will let you work with the Google Nik Collection from out of GIMP. You will learn how to create black and white images at a professional level with the most powerful black and white plugin on the market, and you will learn how to sharpen images and remove noise. We´ll look at making vignettes, and HDR photography. We´ll look at the use of text, kerning text, and how to make eye-catching book covers. You’ll learn everything about all the powerful blending modes, and the practical use of each blending mode will be shown and explained. You’ll learn how to select hair, how to use and make patterns and gradients, and how to use and adjust a tablet. You will learn everything about brushes. How to create brushes yourself, the many special effects you can create with brushes (e.g. to create a flock of birds with just a single stroke, or to create grunge textures), and how to download free creative brushes. We will look at a popular skin retouching technique used by professionals called ‘’frequency separation’’, and different methods for dodging and burning (selectively darkening and lightening of an image). We will discuss color theory, and it’s direct connection to the ways color is manipulated in photo manipulation programs. We’ll discover creative filters that bring a different look and feel to your image. The book is created for the Windows (7,8,10) user. With some extra steps however, the Linux user can also follow along. The book has been printed in black and white to keep the price as low as possible. About the writer: Bernard 't Hooft has over 15 years of experience with professional photo editing, and teaches photo editing at the VolksUniversiteit in the Netherlands. Image editing is a crucial element in the photographic workflow. Image editing tools, most notably Photoshop, are usually sophisticated and deep applications, and are fairly expensive. The only open source tool in this market is the GIMP, which has developed into a powerful, multiplatform system running on Linux, Mac OS X, and Microsoft Windows. GIMP 2.8 for Photographers is a beginner's guide to the only open source image editing tool that provides a no-cost alternative to expensive programs such as Photoshop. Topics include the new user interface and tools, the basics of image editing and simple adjustments, advanced techniques using layers and masks, developing RAW images, working with the improved text tool, and preparing high-quality black-and-white images. The most important editing functions are presented in individual, easy-to-follow workshops. A bonus section on the included DVD describes special techniques for web graphics. GIMP 2.8 for Photographers has evolved from classroom materials that the author developed and taught in courses and workshops on image editing with the GIMP. GIMP is a free alternative to Adobe Photoshop with tons of professional-grade features. But with so many powerful tools and menu options, GIMP can be difficult to master. Whether you're struggling to get started or trying to master some of GIMP's more complex features, you'll find the answers you're looking for in The Book of GIMP. The book's second half offers a comprehensive reference to GIMP's many features, including color balancing, masks, filters, and plug-ins. You'll find tools described in unparalleled detail, with coverage of nearly every option and parameter. With illustrated tutorials and detailed references, The Book of GIMP is sure to become your one-stop guide to just about everything GIMP. 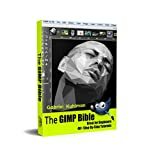 The GIMP Bible is the ultimate reference and guide to the free, recently updated, photo-editing software - GIMP. Due to its license-free application, this Adobe Photoshop-like image manipulation program is probably the most-used software in the world. If you're a beginner photographer or a professional, then this detailed how-to guide will quickly show you how to make the most out of all your great photographs. Every tutorial has been created using high-quality images and easy-to-follow steps that you will appreciate as you navigate your way from lost beginner to experienced user. We purposefully limited our text to include only the information you need to perform each technique. We think this is the best way to teach something new like GIMP 2.10. Here are the 40+ different skills and techniques you'll learn in our first version of The GIMP Bible. We are always working on more. Expect Part II by June 2019. Have you always wanted to do the things the pro's are doing? Now you can! In ’The Ultimate GIMP 2.8 Guide’ you will learn professional photo editing, retouching, and e-book cover design in GIMP 2.8 in easy steps. The book starts from the very beginning, so when you are new to photo editing, that's no problem! The book starts with installing and configuring GIMP 2.8 to make it look and act as Photoshop. Then all aspects of photo editing are covered, and no stone will be left unturned! Everything will be shown in easy to follow steps. You will learn how to improve and correct photographs professionally, and how to work with layers. You’ll learn how to crop images, how to resize images, how to save images for web, how to save images for print, and how to make PDF's. You will learn professional retouching, like skin retouching with frequency separation, Liquify (for example to make someone thinner), how to let the program remove objects, and how to remove objects with the clone and heal tool. You will learn how to use masks, and how to make selections. In Chapter 5 we will go in to making professional selections with just a single click (this is not possible in Photoshop!) using the patented 'U-point technology'. The U-point technology is delivered by the Google Nik Collection, a professional high-end photo editing ‘’plug-in’’ suite, used by professional photographers. The Google Nik Collection and its intregration into GIMP will be discussed in its whole. So in addition to gaining great expertise in GIMP, this book will also cover the complete Google Nik Collection. We’ll download and install the software, together with a special plugin that will let you work with the Google Nik Collection from out of GIMP. You will learn how to create black and white images at a professional level with the most powerful black and white plugin on the market, and you will learn how to to sharpen images and remove noise. We´ll look at making vignettes, and HDR photography. We´ll look at the use of text, kerning text, and how to make eye-catching book covers. You’ll learn everything about all the powerful blending modes, and the practical use of each blending mode will be shown and explained. You’ll learn how to select hair, how to use and make patterns and gradients, and how to use and adjust a tablet. You will learn everything about brushes. How to create brushes yourself, the many special effects you can create with brushes (e.g. to create a flock of birds with just a single stroke, or to create grunge textures), and how to download free creative brushes. We will look at a popular skin retouching technique used by professionals called ‘’frequency separation’’, and different methods for dodging and burning (selectively darkening and lightening of an image). We will discuss color theory, and it’s direct connenction to the ways color is manipulated in photo manipulation programs. We’ll discover creative filters that bring a different look and feel to your image. This book also comes with 8 hours of HD video. At the video platform you can ask me questions personally, which I will answer within 48 hours! I hope to meet you in the discussion forum. The book and course are created for the Windows (7,8,10) user. With some extra steps however, the Mac and Linux user can also follow along. Have a Mac / Linux? Contact me at the platform! The book has been printed in black and white to keep the price as low as possible. Although black and white doesn't compromise the learning experience, you will also get a Full Color PDF of the book. With the video course all learning material (images, plugins etc.) is included! I hope to meet you at the platform! About the writer: Bernard 't Hooft has over 15 years of experience with professional photo editing, and teaches photo editing at the VolksUniversiteit in the Netherlands. He has gathered his knowledge into a bestselling GIMP 2.8 e-learning course and accompanying book, and has over 14,000 students. is the best companion for all new users of the amazing GIMP software. If you want to really get a fast handle on the world's leading photo-editing software, then is guidebook will be a great help to you. GIMP is a free, Photoshop-like image manipulation program, and as its use grows, so does the demand for detailed instruction on how to get the very most out of it. GIMP Bible is the most comprehensive and current independent GIMP reference available that goes beyond official documentation. If you're a digital artist or photographer, the step-by-step explanations in this authoritative guide show you how to power-use GIMP throughout a production pipeline. Topics include understanding the GIMP interface and how to work with it, how to use all of GIMP's tools to create high-quality images, GIMP's default filters and plug-ins, advanced techniques for customization with Python and Scheme scripting, and much more. Get the most out of this free image editing tool for your production pipeline with the GIMP Bible.